This is my second pit bull helmet very comfortable light weight and very good looking. Great price . I purchased this helmet for 2 reasons...I have a pinched nerve in my neck and expect the lighter helmet to be more comfortable. I first went looking for the lightest avaliable helmet of this style that actually seemed to afford some protection as well. When I found that this helmet was a very strong contender, there was the unimpeachable recommendation from my wife, who also has this helmet, that put it at the very top of my list. 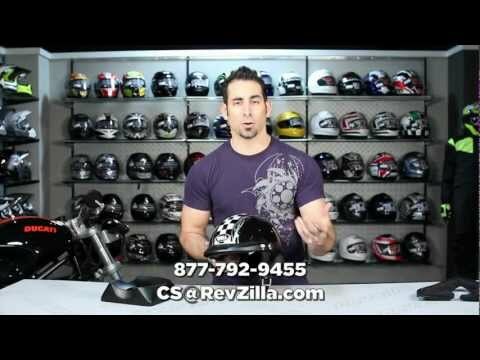 Revzilla provided me with the best price and the rest is history. I particularly like the feature that allows adjustment at the base of the neck. I needed a half helmet for city streets on my way to school. Full face helmets make me sweat like crazy and make me look exhausted and worn out before I go to school. I know half Helmets are not as safe, but this seems pretty good for what I need it for. I will wear my full face helmet for longer rides but this is perfect for around town. The size dial and comfort/look were my selling points for the Pit boss. It sits lower on my head so My 3X head does not look like a big mushroom. The helmet did not fit comfortably with the Adjuster in it. Seems to run 1 size small. Removed adjuster and fits great. Great look, just a little concerned about the Sun Shade as I wear Glasses and have very little room between the shield and my eye ware. Have put about 2000 miles on this helmet so far and have no regrets with my purchase. It stays put at highway speeds, the adjustment wheel on the back of the helmet is a great option to help keep the helmet in place. The drop down viser is a cool feature and didn't care if it the helmet came with one, but having used it occasionally I am glad for this option. The neck wormer is another good feature to have if you ride in cool weather. The chin strap with a snap on the end of the strap to secure the tail after going through the "D" rings is really good feature to have. The black opts graphics are a digital camo and are suttle on the helmet, they don't stand out but are there like ghost graphics...I usually take a size medium but had to go with a large....The order and shipping was excellent, was expecting it on Monday or Tuesday and received it on a Friday. Not my 1st pit boss but 1st black ops. Good for all non extreme weather and I wear glasses the drop down visor works great to get you on home in unexpected rain shower. 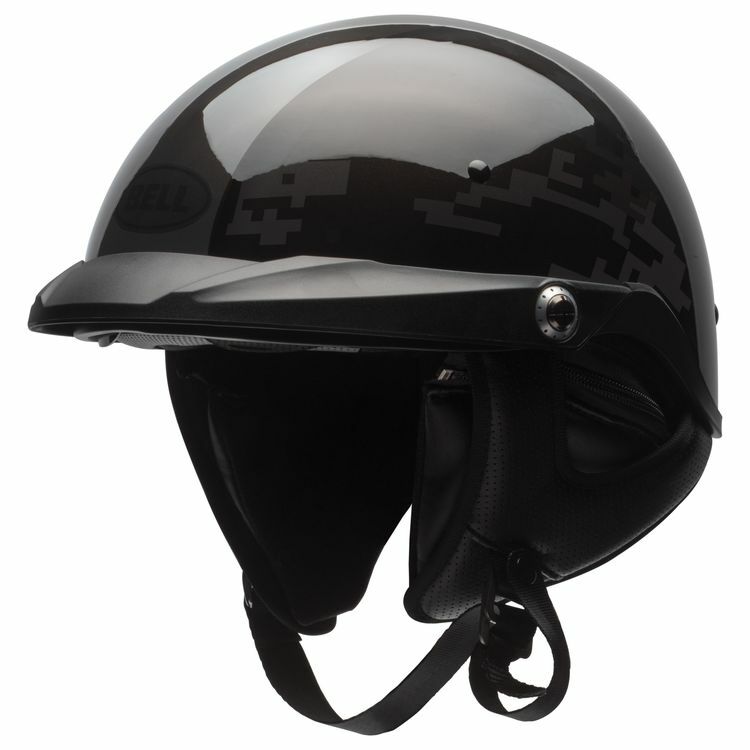 I do recommend it to my friends and get good comments on the cosmetics of the helmet. All I can say is thank you Bell for producing a half helmet as good as this. Zero lift, even at 90 with no windshield, and zero pressure on the chin strap. The look is great, the fit is great - best helmet I've ever owned. I have two of these helmets. They are great. The adjustable latch mechanism on the back really secures it your head. Helmet stays put even when riding at high speeds. The drop down visor is great for when it rains. Wish they had a better color selection but the quality of this helmet makes up for that. Low profile half helmet that looks and feels great. I liked the style of the Pit Boss. The speaker pockets in the neck curtain are a nice feature. I also like the drop down sun shade which works very nice. The Black Ops graphics could be a little bolder. They are so dark, you hardly know they are they. Your video review. Wanted a lower profile half helmet. Looking for an additional helmet to wear. Liked the look of this. Reviews were good, face shield and adjustable fit. Good price point as well. I drive a ute with a roll cage. And, I am not comfortable with a full face helmet. Bell makes quality products. Looked cool. Wanted a half-helmet. Light. Visor. DOT. Sizing dial. I wanted to replace the Bell Rogue that I had purchased prior to this helmet. Hopefully I will be happier with the Pit Boss than I was with the Bell Rogue. Needed something lighter for slow speed rides downtown. Especially at night due to fact my face is so white it acts like spot light reflecting back on the face shield in my full face helmet and temporarily blinding me. As I said in my earlier comment, I really like half helmets. I will continue to wear them, but only on day rides here in Texas when it not too cold, or when it's just too hot for my new Shoei Neotec. Needed an extra helmet and liked the integrated shield. Works great because I can wear my sunglasses and if I forget my clear one's I have the shield for night time. Little bit. But it's the best fitting helmet I've ever had. The dial adjustment on back is really helps with fit and the helmet doesn't feel like it's trying to fly off my head at highway speeds. Not at all, that’s why I chose this particular half helmet. Thank you, I'm looking for all it has to offer but really want a lower profile. Do you or anyone you know heard of the LS2 Rebellion? Thank you, I love the features. What do you wear while riding? Have you looked at the LS2 Rebellion? Head measures 22.5 inches. Medium or large helmet? You need to show inside of helmet. Adjustment of fitting wheel, neck curtain removal etc. No need to show 3 min of outside helmet?